This unit will provide a high level overview of the essential job duties for Prime Timers. It is intended to be general in nature. Your Store Manager will provide you with the details and training to fulfill these duties. As you go through this unit, take notes on items that you don't understand. Write down any questions that you have. After the unit, meet with your Store Manager and discuss. Mark all of the items that are basic expectations of the position. Your position exists to respond to questions or needs of customers and to assist customers with inquiries or purchases. As part of this day to day customer interaction using verbal and written skills to assist customers are a must. Prime Timers need to be able to answer basic questions regarding products and orders, as well as being able to identify when to escalate the question or concern to a member of management. To ensure proper payroll, all employees should clock in and out utilizing the POS terminal, to record start times and end times. Your Store Manager will show you how this is done. Mark all of the items that are true. It is required to clock in, but clocking out is done by the Store Manager. It is required to clock out, but clocking in is done by the Store Manager. It is required that you clock in and clock out. A daily huddle is conducted prior to the store opening. The huddle is a vehicle that ensures updates are given to front-line employees. All employees participate in the huddle meetings. Huddles are important and are intended to relay new information or give reminders of key points. Mark all of the items that are true regarding huddle meetings. A daily huddle is conducted prior to the store opening. Huddle meetings are usually held daily, unless you are really busy. Some employees do not have to participate in huddle meetings. Updates, reminders and new information are conveyed in huddle meetings. Gossip and rumors are conveyed in huddle meetings. Prior to the store opening, employees with approved log-ons, will log in to either nPOS or the NetSuite system. This is done using a POS terminal to access basic, company specific information and allows for inventory and customer service inquiries. Your Store Manager will demonstrate this process if you are required to log in. When customers are approached on the sales floor or when a customer approaches the service counter, Prime Timers need to verbally acknowledge and greet the customers. This will ensure that customers feel welcome and appreciated. Immediately after greeting the customer, gather information about the school, grade and gender of child(ren) being shopped for. It is helpful to also to ask whether this shopping excursion is for the full uniform or for fill-in pieces. In addition, the customer should be asked about the desired sizes, colors and quantities of each item they desire. This will ensure that the customer receives the desired selection(s) and that order picking is fast and efficient. the desired sizes, colors and quantities of each item they desire. will ensure that customers feel welcome and appreciated. gather information about the school, grade and gender of child(ren) being shopped for. whether this shopping excursion is for the full uniform or for fill-in pieces. After the initial greeting and data gathering, Prime Timers will then access the nPOS system to pull up the desired school uniform programs for the customer. nPOS works much like a website, enabling you to educate the customer on what items are required and optional for their school. 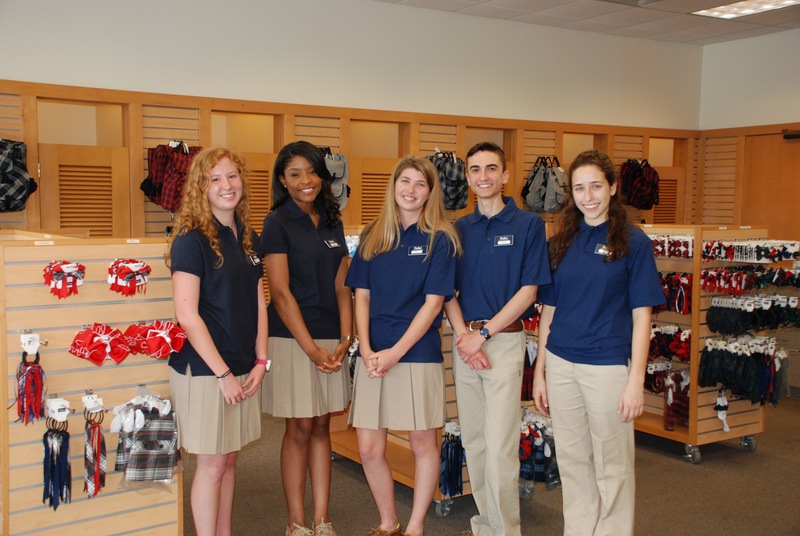 All Prime Time employees need to be able to access school uniform programs in nPOS as well as determine what needs to be pulled from the stockroom for customer try-on or purchase. The Store Manager will show and explain how to best access the school uniform program requirements and grade specific items for schools in nPOS. After the initial greeting and data gathering, Prime Timers will then access the counter book to find the available inventory and stock numbers for the desired items. As part of our one-on-one customer experience, all Prime Timers are expected to know and understand the products we offer. This includes the size ranges offered, fabric care, as well as value added features and warranties of our products. Prime Timers need to be able to speak about size cuts (slim, regular, husky, etc. ), growth features, fabric care, and warranties. Resources are available to help you learn this, and over time the knowledge will be gained. Cleaning is a duty that needs to be performed at Closing in order to maintain a pleasant environment for our customers and for ourselves. Besides maintaining and enhancing the surroundings, good store hygiene also reduces the spread of germs and bacteria and reduces the risk of rodent or insect infestation. Sweep, mop, and / or vacuum front of store and restrooms. Use paper towels and non-abrasive cleaning products to clean windows, doors, mirrors and service counters. Gather trash from trash cans and to break down scrap cardboard using a box cutter. Clean the restroom using non-abrasive cleaning products to sanitize the toilet and sink. Cleaning is a duty that needs to be performed at Closing in order to maintain a pleasant environment for our customers and for ourselves. Full time employees are expected to participate in cleaning as part of the end of the day procedures. Customers come in all shapes and sizes. That is why we take the time to accurately measure them to make sure their merchandise fits properly and looks great. Typical measurements for apparel includes measuring the waist, chest, and inseam. Accurate measuring ensures proper fit and allows for growth. When customers are unsure of their current size or do not fall within the standard Parker sizes, measurements are required. Measurements are made with our Parker measuring tapes. These special tapes measure to the students size in our garments. You will always note these measurements on a School Uniform Checklist form for the parents to take home. Also, all employees should be able to use a Brannack Device to obtain foot sizes for proper shoe fit. The Store Manager will train you to take accurate measurements. All employees will be trained to obtain measurements, however if you are uncomfortable taking measurements, notify the Store Manager. ensures proper fit and allows for growth. will train you to take accurate measurements. includes measuring the waist, chest, and inseam. to make sure their merchandise fits properly and looks great. measures foot sizes for proper shoe fit. When a customer has requested an item that you are unable to locate in the stockroom, or when a customer makes a phone inquiry, use the NetSuite system. This will help to determine if there is on-hand inventory for the specific stock number(s) and size(s) they desire. This information can then be relayed to the customer or another employee. All employees should be able to access the store inventory database as well as the Stock / Size database. The Store Manager will provide instructions for using the data base. Only some employees should be able to access the store inventory database as well as the Stock / Size database. When a customer has requested an item that you are unable to locate in the stockroom, use the MARK system. This will help to determine if there is on-hand inventory for the specific stock number(s) and size(s) they desire. When merchandise transfers from another store, or vendor shipments are received, and the product will not fit in bins - it is necessary to place excess stock in an area relevant to the bin stock. This is to ensure that when bins become low, or empty, that back stock is readily available. It also maximizes shelf and floor storage. Prime Timers need to be able to count and label inventory placed in overstock box. Specific training will be provided. As part of the end of day procedures all employees need to fill bins to replace merchandise sold during the day. This requires using step ladders and standard folding ladders to access overstock and making adjustments to overstock tags. This helps to maintain an orderly, up to date stockroom and ensures that customers do not have to wait during normal store hours. Customer orders are frequently received from on-line customers. These customers expect the same level of quality, attention and speed as in–store customers. To assist in the speedy and efficient processing of web orders, all employees need to be able to locate school specific stock based on the school number and name. The same goes for identifying generic stock. As part of the fulfillment process for sales orders, sales order picking is used and items are pulled based on stock numbers. This will be explained as part of your training in the store. Sometimes we do not have the desired merchandise in stock. An order is required when something is out of stock in the store. Fulfilling sales orders is an important part of creating and maintaining customer satisfaction. To assist in the fast and efficient processing of sales orders, printed pick sheets are used. All employees need to be able to pick sales orders and locate school specific stock based on the school number and name. The same goes for identifying generic stock. As part of the sales order picking progress, orders are filled based on stock numbers. This will be explained as part of your training in the store. printed sales orders are used and items are pulled based on stock numbers. printed sales orders are used. This unit provided you with a high level overview of the essential job duties for Prime Timers. It was intended to be general in nature. Your Store Manager will provide you with the details and training to fulfill these duties. As you went through this unit you were encouraged to take notes on items that you didn't understand. Now it is time to meet with your Store Manager and discuss.